When you think about dog breeds with wrinkles, perhaps thoughts of adorable rumpled little puppies come to mind. If you find dogs coming in a wrinkly-skinned package irresistible, rest assure you are not alone. Countless dogs lovers are drawn to those corrugated pumpkin faces; however, it’s important to recognize that all those wrinkles may need some TLC. Also, when considering opening your heart and home to a new dog, it’s important to look beyond appearance and consider whether your lifestyle is a good match for those dog breeds with wrinkles. Following are dog breeds covered with wrinkles along with some interesting discoveries about the purpose of those wrinkles. Say the word wrinkles and images of Chinese shar-pei come often to mind. Some people nickname these dogs “little hippos” or “the dog in need of ironing” because of these dogs’ wrinkly appearances. When shar-pei are puppies they are adorable piles of wrinkles. As they develop though, they tend to “grow into” their loose skin, and it’s time to say bye-bye to the skin folds on their legs flanks, and bellies. However, the profuse wrinkles on the head, neck and withers are there to stay–and for good. Shar-pei are quite ancient dogs originating from the south of China and dating back more than two thousand years. What’s the purpose of shar-pei wrinkles? It appears that the shar-pei’s loose skin and prickly coat was developed to help them fend off wild boar. Later on, when shar pei were employed for dog fighting, their loose skin once again came handy, making them capable of turning and biting back the opponent. Did you know?According to research by the Universitat Autònoma de Barcelona the recent increase in thickness and wrinkles in the shar-pei dog breed is the result of an inherited skin disorder known as cutaneous mucinosis which causes a build-up of mucin in the layers of the skin. These small dogs are blessed with wrinkles and a clown-like personality that is likely to brighten most people’s days. And this is not surprising if we look back at the pug breed’s history. The Pug originated from China and is quite an ancient breed that has been known since before 400 BC. Pugs were selectively bred to provide companionship to Chinese emperors, making them much cherished and pampered lap dogs. These fortunate pooches were highly valued and there’s belief that they were even guarded by soldiers. Later on, pugs were spread to other areas of Asia and in Tibet, where they provided companionship to Buddhist monks who kept them as pets in their monasteries. Why do pugs have wrinkles? The features of pugs along with their wrinkly faces have been selectively bred by Chinese breeders because they were appealing, or better adorable to say the least. You won’t likely see these dogs much around as they’re not too popular abroad, but they are sure to leave an impression on those who see these wrinkled fellows for the first time. First off, these dogs of Italian descent are massive, often weighing over 150 pounds. Secondly, those wrinkles are quite impressive! The wrinkles are every where so much so you’ll literally see them rolling as the mastiff dog moves about, but they are especially noticeable on the head and dewlap. The presence of wrinkles and skin folds in some parts of the face are so typical of the breed that their absence is considered means for disqualification in the show ring. Neapolitan mastiffs derive from ancient molosser bloodlines that descended from Roman war dogs. They were then employed as loyal estate and farm guardians. Why do Neapolitan mastiffs have wrinkles? The wrinkles along with this breed’s other unique features are the result of years of selective breeding. With a history of war dogs and then estate and farm guardians, most likely the mastiff’s wrinkles were appreciated because they gave these dogs an imposing look. According to the book “The Complete Dog Book” by the American Kennel Club, there are chances that farmers of the Neapolitan area of southern Italy purposely bred an “alarmingly ugly dog” with looks that would have repulsed any invaders. But they’re far from being ugly, aren’t they? Does the movie Turner and Hooch bring any memories? 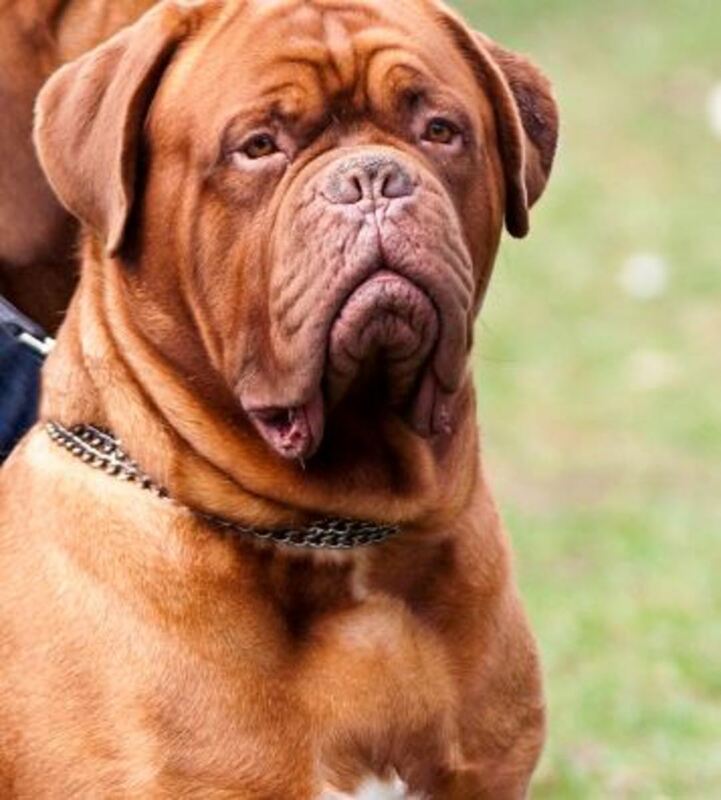 Hooch was a Dogue de Bordeaux (French mastiff) and he played the role of a troublesome pooch who managed to tear police investigator Scott Turner’s house apart and chew on his car. Also known as French mastiff, just like the Neapolitan mastiff, the Dogue de Bordeaux descends as well from the ancient molossers and inherits their massive body and large head. Dogue de Bordeaux are one of the most ancient French breeds but their origins are a bit shrouded in mystery. Some believe they derive from bullmastiff and the bulldog, others believe they derive from the Tibetan Mastiff or the Dogues de Bordeaux of Aquitaine. Regardless, they have quite a colorful history being used for guarding flocks, hunting bears and foxes, bull-baiting and even as war dogs. 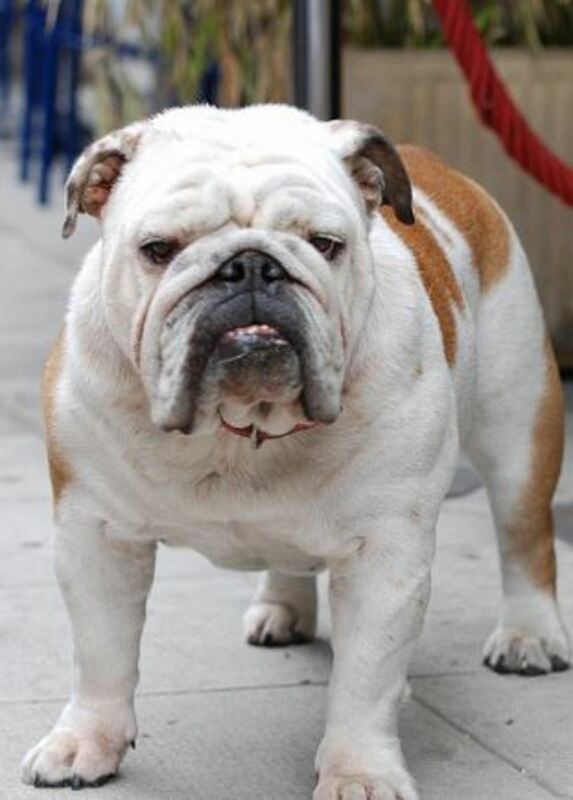 Another dog breed known for its wrinkles is the bulldog, a dog breed originating from the British Isles. Originally bred as a butcher’s dog for the purpose of subduing animals for slaughter, the bulldog was then employed in the bloody sport of bull baiting, a cruel practice that was fortunately outlawed in England in 1835. The bulldog today has changed a lot in both looks and temperament and has now becomes a beloved companion. The American Kennel Club breed standard depicts the bulldog as having the head and face covered with heavy wrinkles and two loose pendulous folds of skin forming the dewlap. While there are different types of bulldogs, one question worth of asking is, why do bulldogs have wrinkled skin? There are many theories, a common one is that in the old days of baiting, those wrinkles helped channel blood away from these dog’s eyes, but there are other explanations out there. According to Animal Planet their wrinkles may have helped them better fight against their opponents. As with the shar-pei, even if they happened to be gripped by an opponent, their loose, wrinkly skin allowed maneuverability, so that they could defend themselves and fight back. The Bull Dog Club of America also mentions that the loose skin came handy when bull baiting preventing penetration of the bull’s horns. The blood hound was selectively bred for its wrinkles and for a very good reason: those wrinkles helped these fellows out in their jobs! No, contrary to what the name may suggest bloodhounds weren’t used for the bloody sports as several of the other wrinkly fellows we have seen. Instead, there’s belief that bloodhounds were bred by monks of the Abbey of Saint Hubert for the purposes of tracking deer and boar. Specimens of these hounds were often given as a gift to the King of France. Their name derived from the fact that they were were full “blooded” hounds and prized gifts among kings and nobles. Why do bloodhounds have so many skin folds? It’s likely that, along with their pendulous ears, droopy jowls, saggy skin folds, the wrinkles help these dogs track scent. Basically, the long ears act as “brooms” sweeping up scent particles upward to reach these dog’s potent noses, while according to PBS Nature, that loose skin and wrinkles on the bloodhound’s face and neck help trap some of those scents. Did you know? The brow wrinkles in the bloodhound may have a protective function. Since these dogs are perpetually tracking with their heads low to the ground, those wrinkles may help protect their eyes from the dangers of sharp vegetation. While all those wrinkles may look appealing, as mentioned, wrinkles in dogs may need some care. Dogs with deep wrinkles and skin folds are prone to getting food, dirt and moisture trapped within all those nooks and crannies. 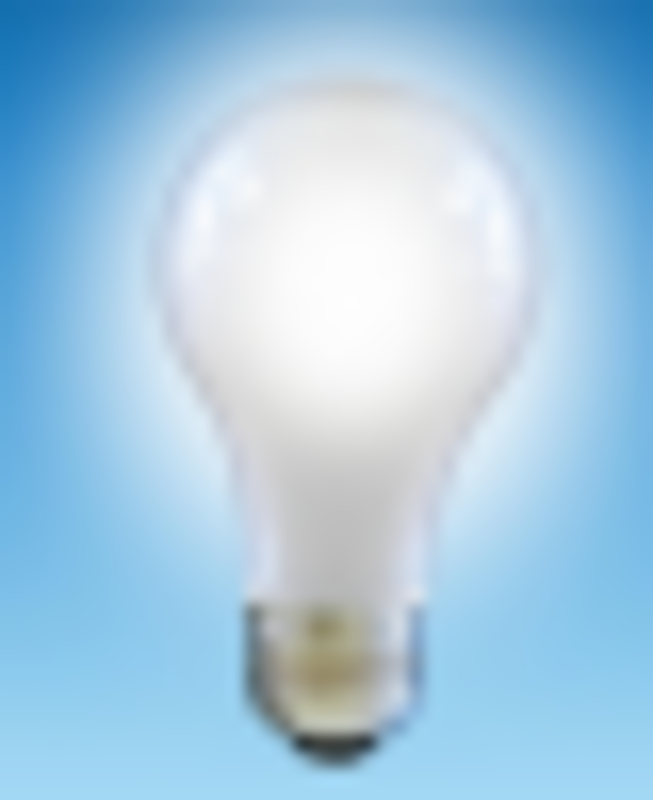 On top of trapping dirt and debris, wrinkles are also prone to constant friction. 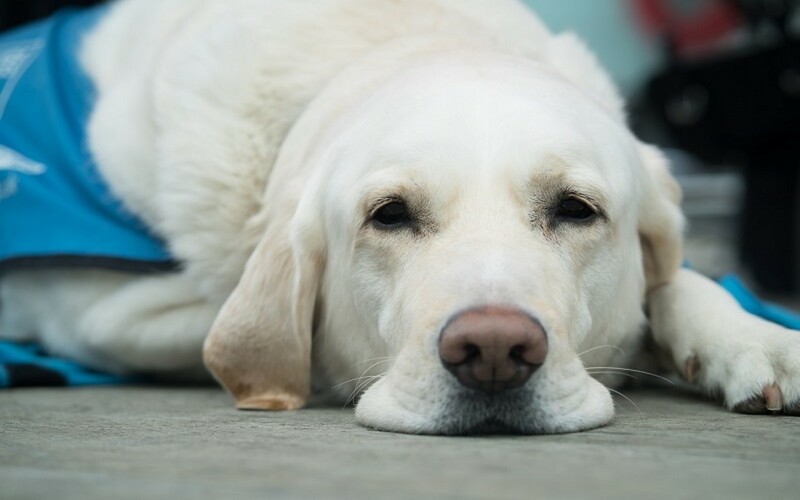 Wiping the wrinkles with hypoallergenic baby wipes or wipes especially designed for wrinkly dogs can help keep the wrinkly coat clean and prevent annoying skin infections. Areas that are particularly prone to annoying irritations and infections and that require more care include the lip folds, facial folds, arm pit areas and the base of the tails. PBS Nature, The Bloodhound’s Amazing Sense of Smell, retrieved from the web on December 18th, 2016. Universitat Autònoma de Barcelona. “Why Shar Pei Dogs Have So Many Wrinkles.” ScienceDaily. ScienceDaily, 16 November 2008. American Kennel Club, Breed Standards, retrieved from the web on December 18th, 2016.